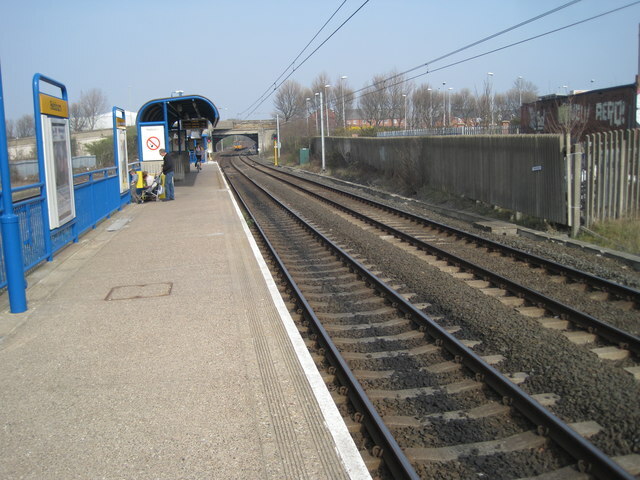 "Opened in 1879 by the North Eastern Railway on the far side of the road bridge, this station was rebuilt and became part of the Tyne & Wear Metro in 1982, on the line from Pelaw to South Shields. View north east towards Jarrow and South Shields. The station was rebuilt as staggered platforms with eastbound trains using this new platform and westbound trains still using the original station site." Photo by Nigel Thompson, 2012.